the ‘gap’ between the actual and minimum attainable supply cost. See Fig. 200 . The traditional THEORY OF SUPPLY assumes that firms always operate on their minimum attainable cost curves. In contrast, X-inefficiency postulates that firms typically operate with higher costs than this. This occurs, for example, because of inefficiencies in work organization (RESTRICTIVE LABOUR PRACTICES such as OVERMANNING, demarcation rules), in the coordination of activities (inefficient deployment and management of resources arising from bureaucratic rigidities), and in motivating workers to achieve maximum output. X-ineffciency is likely to be present in large organizations that lack effective competition ‘to keep them on their toes’ (especially MONOPOLIES). See also PRODUCTIVITY, ORGANIZATIONAL SLACK. X-inefficiency has been estimated to be in the area of three percent of the GDP. In an earlier generation of studies of US banks Berger Hunter and Timme (1993) argue that X-inefficiency constitutes 20 percent or more of bank costs. Within this manager-oriented tradition, Leibenstein's (1966) work on X-inefficiency is perhaps the most radical break with IO economics. Roger Frantz, in the concluding chapter, notes that from the late 1960s through to 2002 approximately 80 journal articles were published trying to estimate the size of X-inefficiency and these studies consistently showed support for its existence across numerous industries and countries. This theoretical view is consistent with that of economists who regard the technical inefficiency estimated by the stochastic frontier production model as X-inefficiency (e.
Several chapters analyze various aspects of the problem of x-inefficiency. Two X-inefficiency measures are derived, one from the stochastic cost frontier model and the other from the distribution-free model. 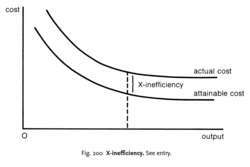 The term X-inefficiency was invented by Leibenstein (1976) to distinguish technical from allocative inefficiency. The banking literature also suggests that potential gains from the elimination of X-inefficiency exists in most bank mergers, but are frequently not realized [26; 29; 14; 5]. However, equitable solutions may impose such costs as allocative, X-inefficiency, dynamic inefficiency, and the cost of regulation to the firm and the regulatory agency. Developing his concept of x-inefficiency, Leibenstein argues that economic agents are typically producing less than they would under a relatively ideal set of circumstances, circumstances that relate quite closely to the set of industrial relations prevailing inside the firm.